On the day in which your designation is made public to be part of the College of Cardinals, I wish to express to you a cordial greeting together with the assurance of my closeness and my prayer. I hope that, as associate of the Church of Rome, clothed in the virtues and sentiments of the Lord Jesus (cf. Romans 13:14), you will be able to help me, with fraternal effectiveness, in my service to the universal Church. The Cardinalate does not signify a promotion, or an honor, or a decoration. It is simply a service that calls for enlarging one’s vision and widening one’s heart. And, although it seems a paradox, this ability to look far ahead and to love more universally with greater intensity can only be acquired by following the same way of the Lord: the way of abasement and humility, taking the form of a servant (cf. Philippians 2;5-8). Therefore, I ask you, please, to receive this designation with a simple and humble heart. And, although you must do so with joy and gladness, do it in such a way that this sentiment is far from any expression of worldliness, from any celebration that is foreign to the evangelical spirit of austerity, sobriety and poverty. Farewell, then, until next February 20, in which we will begin two days of reflection on the family. I remain at your disposition and, please, I ask you to pray and to have others pray for me. Wow! What a letter to read! Imagine receiving such a letter if you were nominated to the cardinalate in the Catholic Church. The papal letter is brief, direct, and an unexpected fraternal gesture expressing clear hopes (expectations?) for the men entering into the College of Cardinals. I hope not only the cardinals listen to what the Holy Father has to say, but the rest of us, too. What is said to the new cardinals is said to all the faithful! 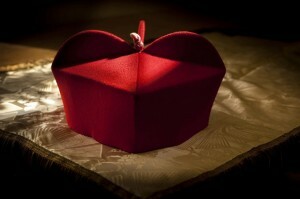 Symbolic of the new form service for Christ and the Church is the adoption of the color red, expressed most often as “the red hat” (seen above) and the reception of a new ring. These are classic signs to the deeper reality of love and service. The wearing of the color red, the donning of the biretta (hat) and the wearing of the cardinal’s ring is a clear sign of willing to die for the Church, and to be of service to the Church at all costs. You might say that being a cardinal is all-consuming in all forms of service that others (deacon, priest, bishop & faithful lay person) may not have: the prayers for the new cardinal at the time of the consistory have a clear element of martyrdom in them. The martyrdom of a cardinal –which hasn’t happened in a while– ought to be a spark for new life in the Paschal Mystery. One of the striking lines in the Pope’s letter is enlarging one’s vision and widening one’s heart. Other parts of the letter that we ought to note is how the cardinal relates to the person of the bishop of Rome: in a personalistic way. Moreover, Francis asks the new cardinals to celebrate with joy yet in a sober manner that is not triumphalistic keeping in mind what the Scriptures reveal.